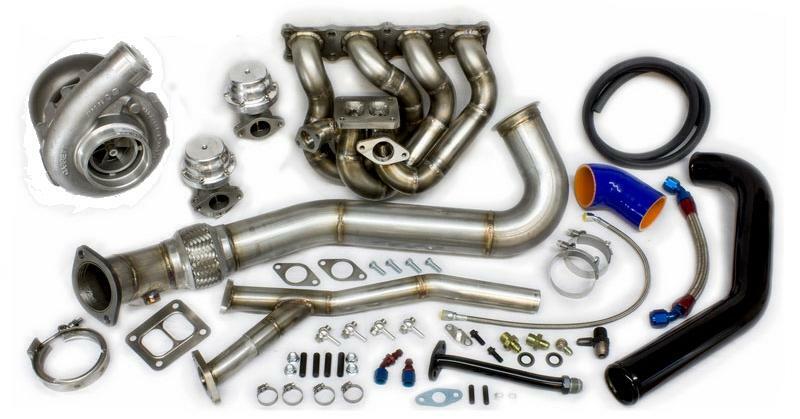 For a serious power upgrades look no further than an ETS Turbo Kit. 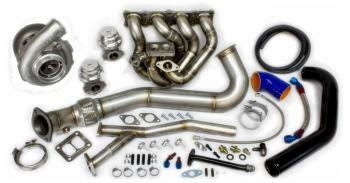 Packed with features like high flowing Equal Length ETS Manifold, true Merge Collector, full 3” Downpipe, direct routed Wastegate Dump, low angle turbo outlet, high flow upper intercooler pipe, Single or Dual Tial Wastegates, and any T3/T4 or Garrett GT series turbos, these kits will get the job done, street or track. Along with great performance, Features such as an exhaust flex, T-Bolt Clamps, 4ply silicone, and braided oil lines, will help make sure that you do not have to use the ETS Life Time Warranty! ETSTurbo Kits come in a variety of configurations. By default, the Piping is Silver, the BOV Flange accepts Stock, TXS or Greddy BOVs, and the Couplers are Blue. However, any of these attributes(and more!) can be customized. If ordering online, please keep in mind, you will have to specify which Turbo, Manifold, Wastegate and any Coatings you want as well (some additional charges many apply).